The comprehensive thyroid panel checks a wide variety of thyroid blood markers. What is in the comprehensive thyroid panel? The comprehensive thyroid panel measures your iodine, T3 free, T3 reverse, T3 total, T3 uptake, T4 free, T4 total, thyroglobulin antibodies, TPO antibodies and TSH blood levels. Why are markers in the comprehensive thyroid panel important? This comprehensive thyroid panel helps screen for a wide range of thyroid conditions and disorders. 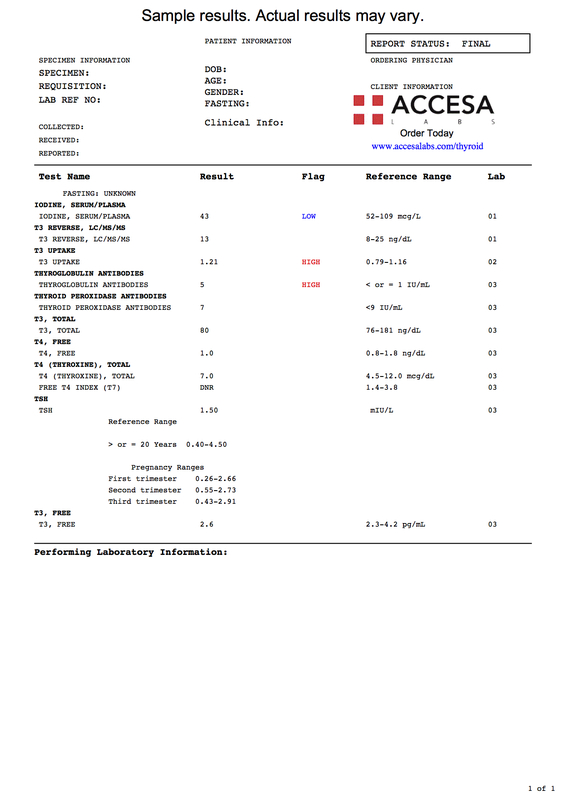 This Comprehensive Thyroid Panel is a blood test. Our comprehensive thyroid panel checks a variety of lab markers related to thyroid health. Markers tested in the comprehensive thyroid panel include the iodine test, reverse T3 test, T3 free test, T3 total test, T3 uptake test, T4 free test, T4 total test, thyroglobulin antibody test, thyroid peroxidase antibody (TPO) test and the TSH test. To get a comprehensive thyroid panel near you, simply order online and get your comprehensive thyroid panel done at a lab near you. Once your comprehensive thyroid lab results are ready, they will be available for electronic download. The comprehensive thyroid panel is suited for people who want a wide range of thyroid tests. To evaluate for hypothyroidism or hyperthyroidism specifically, consider the hypothyroidism test panel or hyperthyroidism test panel respectively. Comprehensive Thyroid Panel at Guaranteed Prices.